... global culinary adventures in a time traveling dreamer's kitchen ... Come join the feast! The year is Asian. Hello, and welcome to My Kitchen and I. Every year I choose a cuisine to explore. This year, it's the year of the Snake! And I'll be continuing to cook mostly Asian foods, particularly Chinese dishes. Have I finally found the best cuisine in the world? Come explore and cook with me and let's find out. Please feel free to share your stories and comment on anything you see here, and thanks so much for visiting. Hope you enjoy the Year of the Snake in food! 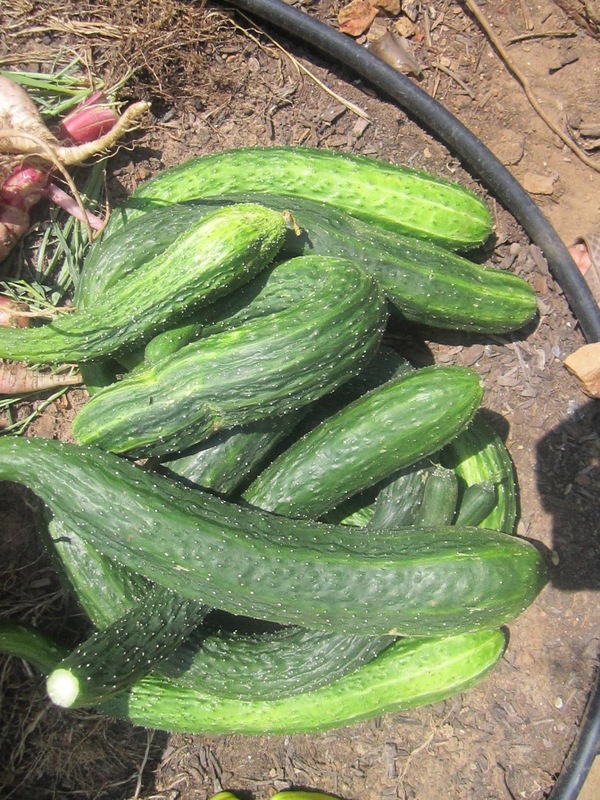 The garden has gone gadzooks out there, and I'm overflowing with Chinese cucumbers. I made a few sushi vinegar-sesame cucumber salads, which I really like, and discovered that Chinese cucumbers are crisper and crunchier than what we're used to. They're also WAY more prolific. I had a bushel basket or so left, and had eaten all the cucumber salads I wanted for awhile. That started me wondering. What else do Chinese people do with cucumbers? So I checked in with Aunt Google. Landsakes was I surprised. 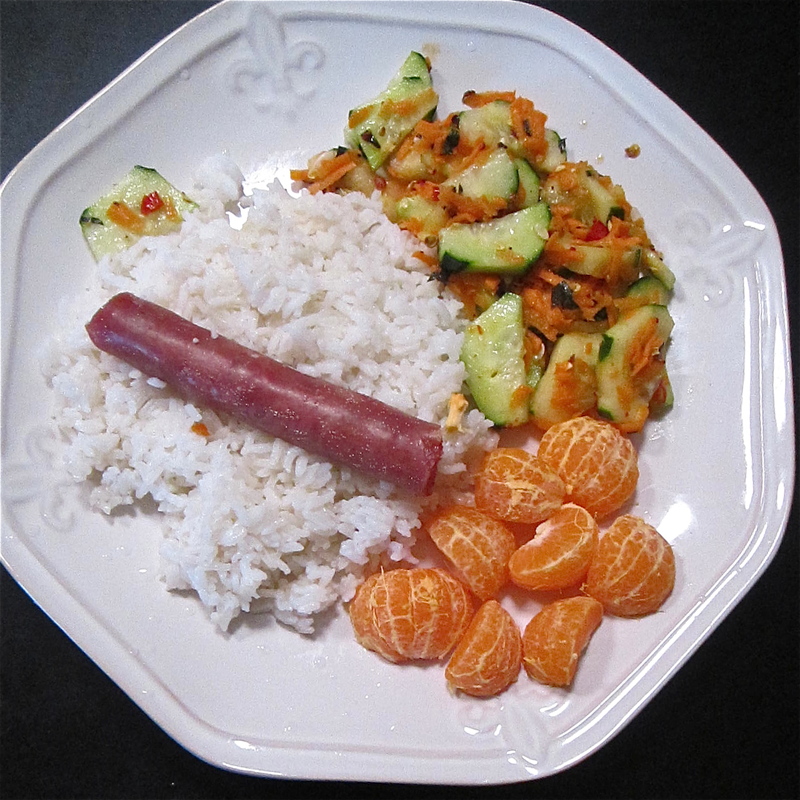 It seems the more normal way to eat cucumbers in Asian countries is to cook them in a stir-fry! Do what you say? Cook cucumbers? Are you nuts!?! I will admit I was very dubious at first, and I am a little bit nuts, too, so looking at this bushel basket full of cucumbers, I decided what the heck? Why not, if I don't like it, I don't have to do it again. Let me tell you I will be doing this again soon. Like tonight soon. Stir-fried cucumber is not just good. It's GREAT. These are amazing! How come we've never done this with a cucumber before? If you can get your hands on a Chinese cucumber at the market, you have just got to give this a try. I did sweet gypsy peppers, yellow squash, cucumber, a little minced ginger, minced garlic and a handful of Thai basil. So fragrant! Oh and hot peppers, too. Of course. I like everything hot hot hot. Marinate the pork in a mixture of equal parts soy and cornstarch, just enough to coat the pieces of meat. I'd say about 1 T of each will coat four servings of meat about right. 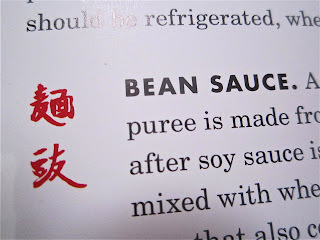 For sauce, measure out 4 T of yellow bean sauce (see left for characters) for about four servings. Add a tablespoon of xiao xing wine to your sauce. This is very similar to sherry. Mix water and cornstarch separately, to serve as a thickener if needed. Now that everything is assembled you're ready to go. If you've got a wok great, but don't sweat it if you don't. A heavy cast iron skillet can work. Position it so half is over the fire and half is not. That way you have a cool spot and a hot spot. I like to stirfry the meat first. Once it's about halfway done, I push it to the cool spot. Then I add the longest cooking vegetables first, stirring them quickly around in the hot spot until they just start to brighten. Off they go to the cool spot where I mix them in with what's already there. I keep adding each vegetable, using the same process, until finally I've got it all in the pan together. I stir everything all around together and then dump in the beanpaste sauce. After it bubbles up, I add a little cornstarch mixture to thicken as needed. About this time, I hear an unexpected knock at the door and who is it? It's my neighbor, Peggy. Just in time for dinner! 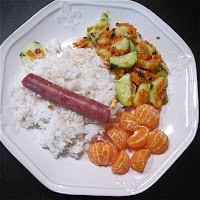 I served this over rice, and both of us were amazed at just how good a stir-fried cucumber really is! 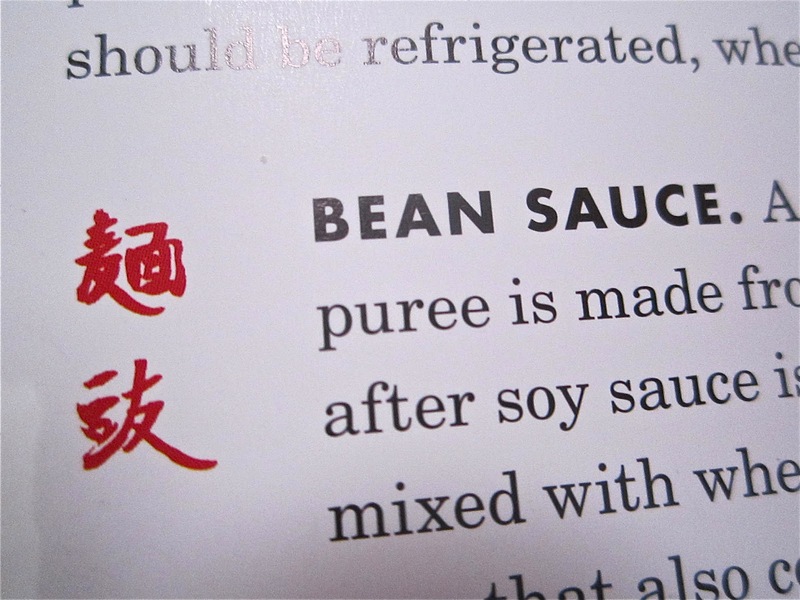 This past weekend, I probably spent three or four hours trying to find a type of bean sauce in Eileen Yin-Fei Lo's book, "Mastering The Art of Chinese Cooking," that I swear does not exist on any Asian grocery store shelves. I had a copy of her characters, duplicated about as well as I could do by hand. Her strokes are not always clear in the book, as they are stylized to look very pretty and artistic. They look nice, but it makes true identification very difficult. One of the downsides to her book. I looked at every jar at my usual market, and there were literally hundreds. Not all were bean sauce, of course. There was leek sauce, there was sesame paste, there was chili paste — but a surprisingly large portion were bean sauce. It was quite overwhelming! And how could I choose just one? Especially when not one matched what I was looking for! So I ended up coming home with six different jars of bean sauce, all with different characters, and none matching what I had been seeking. One of these, I thought, is bound to work. I will just ask my friend Jeff which is closest. But he didn't recognize Yin Fei Lo's characters either. He thought it may be something old and not much used any more. He thinks I've gotten pretty close with this ground bean sauce, though. Yin-Fei Lo's book says the ground version is a little saltier than what she recommends, so I will just use that and omit some salt elsewhere in the dish. In the meantime, if any of you know for sure what kind of bean sauce she means ... do tell! Here's a picture of the characters she gave. I will be trying all these other bean sauces in all the same recipes to see which I like best, and eventually, I'll report back on which is good, better and best. This shopping trip was building all the pantry ingredients for the recipes I'm going to make in coming days. Sort of a beginning Chinese pantry. I consequently had a lot of different ingredients on the list, most of which I found! Surprisingly, I even found the bean curd juice, which I didn't expect. I had in fact looked for it two times before and never found it. Because of its characters, I was looking where the red bean sauces and cubes were kept. It was actually in a different aisle with soy sauces and vinegars. I just about could have kissed that store clerk when she came around the corner with that bottle — but of course I did not say or do any such thing. Good thing, too. Apparently you do not kiss Chinese strangers, nor even joke that you might do so. Jeff says she would have thought I was a really crazy American. My Chinese is not very good yet, but still good enough to get the store clerk to show me exactly where she'd found that bean curd juice. So now I can even locate it again if I decide it's a keeper. The store clerk was quite proud of herself for finding this ingredient, and mentioned it was new. She herself didn't seem too sure about using it. She asked me something like ni zenme zuo le, 你怎么做了，which I took to mean she didn't know how I could make anything off the crazy grocery list she saw. I didn't know how to tell her too much about that. So I just said, wo xiang zuo zhen de zhongguo cai. 我想做真的中国菜。I'd like to make real Chinese dishes. At any rate, after that trip, I have a lot of new ingredients to explore! A broccoli that is heat-tolerant, called gai lan. I've had it at the tea house, and it is really great steamed with a little oyster sauce to finish the dish. I also bought some Malibar spinach which is heat tolerant and doesn't bolt. It's a vine, so it's a really great plant for small spaces, although it is not really spinach. It's just very similar. With the warmer days getting so busy and jam-packed with digging and digging and digging, I've been sticking to some very simple easy dishes. This is one that surprised me, and it's so good and so easy, I've actually made it a couple different times now. 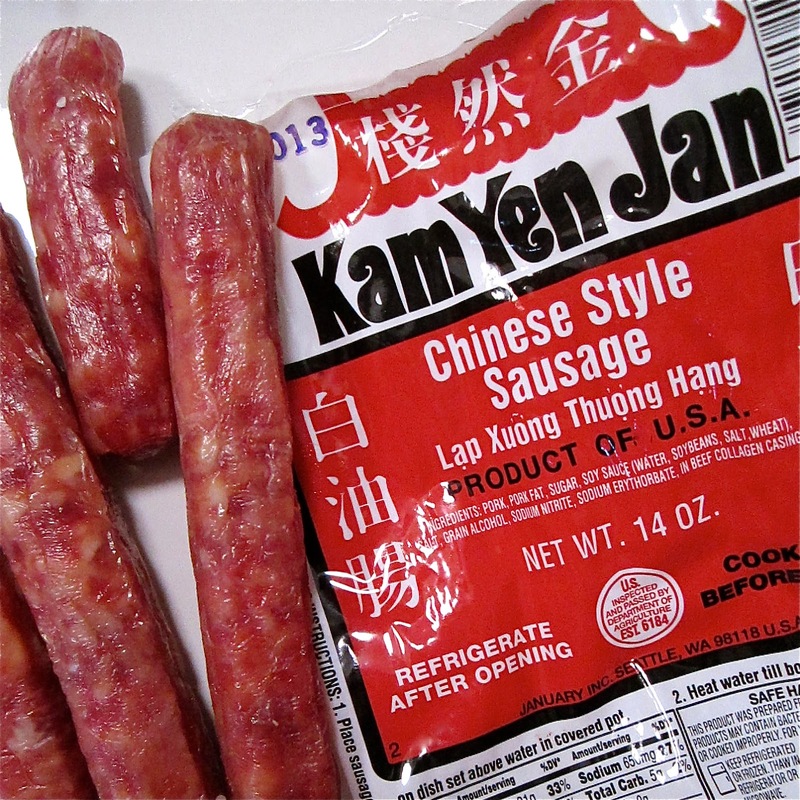 It uses a Chinese sausage called Lop Cheong. This is a savory sweet style of sausage that according to some of my cookbooks will keep for weeks even without refrigeration. However, my package said to refrigerate, so I did. There are many different kinds of these sausages at the store. This is just the one that I was told is the most popular seller. A store clerk also explained to me that on this particular package, the Chinese is written right to left instead of the usual left to right. So if you're buying a different brand, it may well be in reverse order. Since making these I've discovered many more recipes with this ingredient, so you'll be seeing more of these in the near future, but in the meantime this simple dish is well worth making for a quick and easy lunch. and place in a pot with four cups of water. Bring to a boil. Let the rice begin to swell a little. 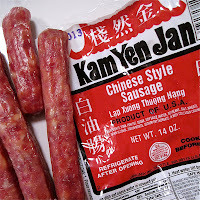 Then place four lop cheong sausages on top and put the lid on it. Cook for 15 minutes on low heat. Turn the heat off and let the pot sit for five minutes. And that is it. You are finished! If you want to fancy it up, you could shred some carrot to cook with the rice, but I think this is really good just like this. 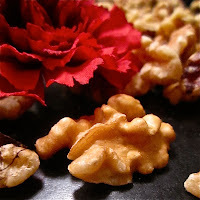 After making several versions of these so-called honey walnuts, I have begun to wonder if some people might skip making the recipe they've published in their cooking book or blog. I found so many bad versions of these wonderful walnuts! The best version so far is in Yin Fei Lo's cookbook, Mastering the Art of Chinese Cooking. She notes that these nuts do not traditionally contain honey, though they are called honey walnuts. They do taste like honey, despite the lack. I did find several recipes that advocated using honey to make these nuts, but after trying it a few different ways with honey, I really cannot recommend it. It sounds wonderful, but you lose the crispy, snap-crackle-pop texture that makes these nuts so special. Honey picks up moisture quickly, and a few hours later the nuts have already lost their zing. Honey also seemed to burn more easily. I know it sounds crazy to put lettuce in soup, but this might be the tastiest soup I've had yet. It is so good! And so easy — you have to give this Chinese style recipe a try. You know a friend recently asked me why I'm cooking all these Chinese dishes. Was it just to learn the language and culture? Or did I really like the flavors? Or is it just that cooking is some kind of hobby? 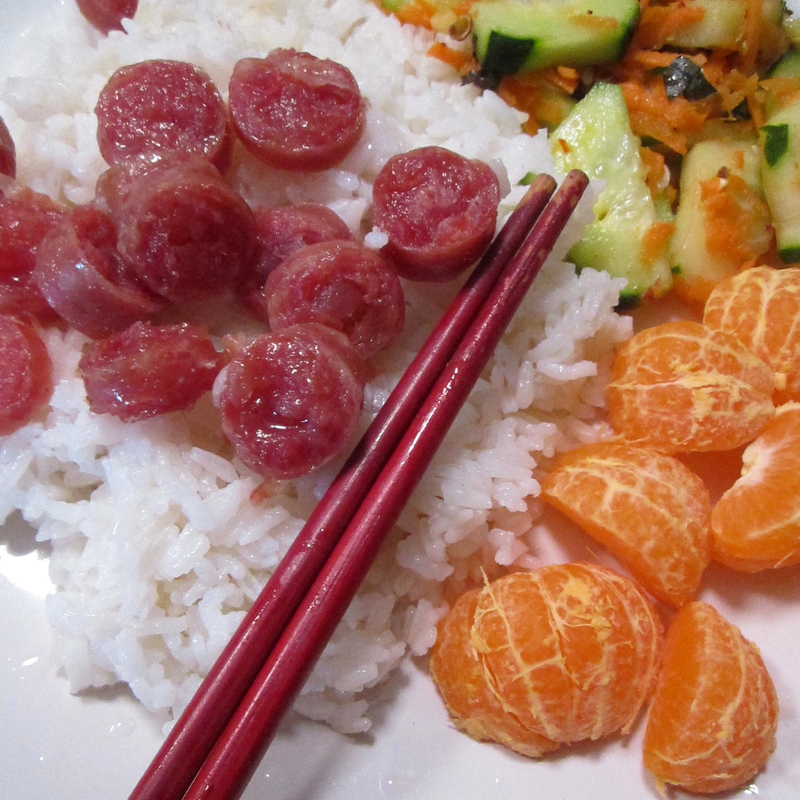 Of course, it's all of the above, and this week's recipe to me exemplifies all the good things I like about Asian foods. 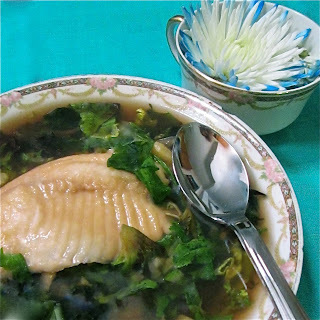 Authentic Asian foods have a simplicity that is very appealing in today's complicated world. Everything is so fresh and goes together so quickly. It's all so pretty, and tastes so good, like something gourmet — yet without the gourmet prices. But, best of all, cooking Asian foods every Saturday lets me have a little bit of an adventure and a little taste of culture, along with what is usually a tasty and very healthy meal. I might not be able to afford to travel to the places where these foods are made, but I can easily bring a bit of the tastes and fun of such travel into my kitchen every week. For me this blog is a great adventure. A way to explore the world without leaving home, all while having a wonderful meal. And not only that, it's a chance to share that adventure with others who enjoy cooking. Because sharing an adventure makes it that much more fun. This month's #letslunch theme is sports snacks. I'm not really all that into your typical sporting events, but I do like a good trivia night with friends. I don't know about you, but when I'm in the midst of the holiday season, there's no time to spend in the kitchen. I still want to eat good healthy food, of course, but it has to be simple. And, not at all least, it has to feel a little bit healthy. And so was born this little sandwich — epic — if I do say so myself. It is great as a main course, but would also work on smaller buns, slider-style, for a fun party appetizer. This spring I planted four tomato plants in the back corner of my mostly inactive garden, hoping for an abundance of red, ripe garden-grown tomatoes. But I guess I was a little late planting them. And then there was a drought, which didn't help matters. The garden thus produced only two ripe tomatoes for me this year, and left me with a whole bunch of green tomatoes that have absolutely no chance of ripening before frost. To say I was disappointed in my gardening efforts, would be understating things a bit. Nothing in my opinion is better about summer than a garden-ripe tomato. Slice one up on a plate, alternating with fresh mozzarella cheese, some olive oil, fresh-squeezed lemon juice and fresh-cracked black pepper. This is such a superb lunch, one I could eat every day. Now I do remember how once upon a girlhood my grandmother would make bacon, lettuce, fried green tomato sandwiches. And those were good. She usually made them at the beginning of the season, to celebrate the ripe tomatoes soon to be had. I went to rescue a green fall tomato to eat a sentimental dinner in her honor, though I wasn't feeling too celebratory about it. Rooting around in the still healthy tomato plants, I was saddened by just how many green tomatoes there really were. Easily 7 quarts. Well, that's just about as substandard as it gets, to me anyway. Out of idle curiosity I googled green tomato recipes as I munched on my BLGT. There surely couldn't be much ... could there? I was actually surprised. Curried pork stirfries, asian pear salads ... people had some really creative ideas for their green tomatoes. Ordinary average single woman living in the middle of nowhere special having global culinary adventures in an ordinary crackerbox kitchen. In other words, yes you can try all the recipes at home! In fact please do! And send me pictures! Apicius: The Project Gutenberg eBook of Apicius: Cookery and Dining in Imperial Rome, by Joseph Dommers Vehling. All recipes are originals except where otherwise noted.. Simple theme. Theme images by luoman. Powered by Blogger.